The Minnesota Pollution Control Agency is preparing to release an updated list of polluted streams, rivers, and lakes, known officially as "impaired waters." It's expected several hundred impaired waters will be added to the list. It's estimated up to 40 percent of Minnesota lakes and rivers are polluted. Federal law requires the state to monitor polluted waters and develop a cleanup plan for those that don't meet standards. But there's not enough money to test or clean up the water. Moorhead, Minn. — The federal Clean Water Act requires the state to test lakes and rivers to see if they're clean enough for drinking, swimming and fishing. It's a daunting task. Minnesota has a lot of water. For example, there are some 92,000 miles of rivers and streams in Minnesota. Based on estimates that 40 percent are impaired, that's about 37,000 miles of polluted rivers and streams. So far, less than 10 percent of Minnesota waterways have been given a pollution checkup. The Minnesota Department of Natural Resources, the Minnesota Department of Agriculture and local watershed organizations all have some role in water monitoring, but the primary responsibility falls on the Minnesota Pollution Control Agency. Standing at the rail of a bridge over the Red River of the North, Tim Olson drops a clear plastic tube attached to a rope into the river. After it disappears beneath the surface of the reddish brown water, he trips a latch that snaps the ends of the tube closed, and pulls the water sample from the river. Tim Olson is a college student who spent the summer and early fall collecting river data for the MPCA. He's checking turbidity, or how clear the water is, because cloudy water carrying a high silt load is often a sign of an unhealthy waterway. He's also measuring the oxygen in the water, and collecting a sample that will be tested for phosphorus. The first step in identifying polluted waters is documenting the pollution. If the water consistently fails to meet state standards for things like turbidity, phosphorus, low oxygen levels, or other pollutants, it's added to the impaired waters list. But collecting all this data is time-consuming and expensive. The MPCA says it doesn't have nearly enough staff to monitor 92,000 miles of rivers and 14,000 lakes, so the agency is more often relying on volunteers to test lakes and streams. "We use data from just about anybody, if it's collected with the right equipment and done in the right manner," says Jim Zeigler, a watershed unit supervisor with the MPCA. Jim Zeigler says data collected by volunteers is a critical part of the impaired waters program. "It can be a watershed district, it can be a school district, it could be another state agency. Just about anybody, if we have good samples, can submit data and we would use the data for this program," says Zeigler. "So when we talk about who's contributing, it's a really wide range of folks that are doing that." But some city officials around the state are concerned about data collected by volunteers. Many point to Grand Rapids as an example of what they see as a flaw in the system. Jim Ackerman, manager of the Grand Rapids wastewater treatment plant, is hoping a two-mile stretch of the Mississippi River in Grand Rapids will be taken off the impaired waters list in the next few months. It was first added to the list in 1998 after a group of high school students collected a series of tests, or data points, from the river, and found dissolved oxygen levels that were below state standards. "We took it very serious that we were on this list, so we started taking more tests," says Ackerman. "There's probably hundreds of data points that have been taken since that summer, and we have not been able to duplicate those low dissolved oxygen readings -- and neither has the MPCA." Since officials couldn't come up with the same test results the students found, Grand Rapids challenged the impaired waters listing. MPCA staff is recommending that stretch of the Mississippi should be taken off the list. A delisting needs to be approved by the federal Environmental Protection Agency. Jim Ackerman says it's taken several years to correct what he sees as a mistake. "There's time and money that would be better spent. Resources are limited, so let's spend our time and money where it makes a difference, not chasing something that really isn't there," says Ackerman. Jim Hodgson, the MPCA's coordinator for the upper Mississippi basin, says the Grand Rapids case is a good example of how the impaired waters process is evolving. If the agency were given the same volunteer data today that was used to list the Grand Rapids reach of the Mississippi in 1998, it's unlikely they would list the reach as impaired. Instead, Hodgson says, the agency would order more testing and try to validate the data collected by the students. 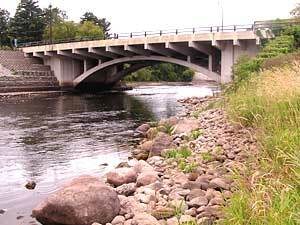 The MPCA is expanding its use of water quality data collected by volunteers. Officials say its the only way to effectively monitor Minnesota rivers and lakes. But monitoring the water may be the easy part of the impaired waters process. Once a lake or stream is added to the impaired waters list, the state must develop a cleanup plan. That cleanup plan is called a TMDL, or total maximum daily load. A TMDL is perhaps best described as a pollution budget. First, each source of the pollution is identified. Then each source needs to reduce pollution by a specific amount. The total reduction of pollution should allow the water to meet water quality standards. Deciding who reduces pollution by how much is called load allocation. That's where the process becomes a blend of science and politics. There can be disagreements about how scientific data is collected and interpreted. Molly McGregor, MPCA's Red River basin coordinator, understands the complex process because she's been working on a cleanup plan for part of the Ottertail River over the past two years. McGregor says it takes more than science to decide how to reduce pollution. "Those are technical issues, but they're also political," says McGregor. "And that's why it's so important to have this foundation of participation with local units of government and citizens. Because ultimately they're the ones who use the river, and will be affected by any need to reduce (pollution) loads." What we do now with our water will greatly affect our flexibility and choices in the future. A critical part of this process is deciding where the pollution comes from. There are two broad categories: Point source pollution comes from a specific source, like a sewage treatment plant or a factory. Nonpoint source pollution comes from the runoff from farm fields, lawns and impervious surfaces like paved streets, driveways and parking lots. The MPCA says nonpoint source pollution accounts for 86 percent of the pollution in Minnesota rivers and lakes. Point sources like sewage treatment plants are licensed and regulated, so it's relatively easy to enforce pollution standards on those facilities. But most nonpoint source pollution, like runoff from farm fields, is not regulated, so the MPCA can't enforce pollution standards. Instead, they rely on people to make changes voluntarily. For instance, farmers are offered financial incentives to reduce erosion and plant buffer strips of grass and trees along rivers and streams. That approach worries the easily identified and regulated polluters, like industry and wastewater treatment plants. They fear they'll get stuck with most of the bill for reducing pollution. The Minnesota Environmental Science and Economic Review Board represents water treatment plant operators across the state. The head of that organization, Bruce Nelson, sees a potentially troubling scenario for cities. A cleanup plan could force cities to spend millions of dollars to reduce the pollution they put into water, but if nonpoint source pollution isn't cleaned up, the water might still be polluted. "Do people contribute to that implementation plan and do those waters become attaining, or do we just have a lot of nice studies and implementation plans gathering dust?" says Nelson. "You spend all that money and you're left 10, 15 or 20 years later with some improvement, but still an impaired water body." For now, the MPCA will continue to depend on voluntary actions to reduce nonpoint source pollution. Assistant MPCA Commissioner Lisa Thorvig says she thinks that approach will work. If if doesn't, she says the agency may have to consider asking the Legislature to impose regulations on nonpoint source pollution. But she says such regulation may not even be realistic. How would the agency enforce pollution regulations across the Minnesota landscape, she wonders, when it doesn't have enough staff to do basic monitoring of rivers and lakes. The cleanup planning process is lengthy, expensive and often controversial. Minnesota has completed only a handful of TMDLs, and dozens more wait to be done. And in the meantime, Minnesota continues to identify more polluted lakes and rivers. The MPCA now spends about $8 million per year on impaired waters. The MPCA has asked for the budget to be increased to $80 million a year. But agency officials say to address all the polluted waterways would take $270 million a year. Earlier this year, the Legislature rejected a plan to raise new revenue for impaired waters. MPCA supervisor Jim Zeigler says each year, the agency falls farther behind. "If we keep listing them (impaired waters) at the rate we're listing them, and the funding for doing the work doesn't change, and the amount of people out there doing the work doesn't change, we're going to have a backlog. I'm already concerned about the amount we have on the list," says Zeigler. As the agency does more cleanup plans, Zeigler is hopeful the process will get more efficient and a little faster. MPCA Assistant Commissioner Lisa Thorvig says the TMDL backlog is so large the state is not currently meeting federal requirements for completing the cleanup plans. There could be federal sanctions if the state doesn't clean up polluted water, but Thorvig says one of biggest concerns is that polluted waterways will restrict future growth and development in Minnesota. The Minnesota Appeals Court has already ruled one Minnesota city can't expand its sewage treatment plant because there's no plan in place to clean up an impaired body of water downstream. "What we do now with our water will greatly affect our flexibility and choices in the future," says Thorvig. There's a laundry list of complex issues swirling around the impaired waters program. Who should monitor the water? How should cleanup responsibilities be divided? Who pays for cleanup? But Lisa Thorvig says while those issues are debated, water pollution gets worse. "In some cases we might not be able to clean up our water bodies, if they get to a point where they're so polluted there may not be an ability to restore them all the way back to where they need to be to meet water quality standards," says Thorvig. It's estimated up to 40 percent of all Minnesota rivers, streams and lakes don't meet water quality standards. The final bill for restoring the state's signature resource might be in the billions of dollars.